JOSEPH PARKER V ANDY RUIZ ROUND BY ROUND: Vector Arena, Auckland New Zealand, packed house. Duco well done, the premiere promotions company in this part of the world has the place buzzing with expectation that their man Joseph Parker (22-0) can create history in becoming the first New Zealand born Heavyweight Champion of the world. Duco have have nurtured Joseph Parker, encompassed him a professional management team and aligned him with world class trainer Kevin Barry. Parkers opponent for the WBO belt Andy Ruiz (29-0), Ruiz at 27 years of age four years older than Parker. Andy Ruiz is looking to create some history of his own in becoming the first man of Mexican heritage to become Heavyweight Champion of the world. Stakes are mammoth for both men! History beckons with the question being whose names goes into the annals of heavyweight boxing history in creating an indelible piece of their own. Ring walk – Parker looks all business, Ruiz calm. Parker looks big, powerful. Ruiz carrying a lot of excess around the midriff but do not let that fool you! The bloke can fight! Stare down – eyeball to eyeball, no back up in either man. They retire to their corners for final words from their respective trainers Kevin Barry and Abel Sanchez. Time to go folks! It’s on! Ruiz walking forward. Feeling out process, each man looking for something rather than working. Ruiz digs a jab to the body. Ruiz looking to make the action coming forward. Parker looking to establish the jab. Ruiz’s head movement is good, making the fight by coming forward. Ruiz trying to make the fight offensively. Ruiz walking forward. Parker hasn’t established his jab, needs to, it’s the best in the heavyweight business when it’s doing the business. Ruiz coming on, calm, doesn’t looked phased by Parker, the pro-Parker crowd. Ruiz digs effectively to the body. Digging to the body seems his modus operandi! Ruiz digging his jab into Parkers midriff again – definitely his plan. Ruiz sends down an overhand right, comes up short. Parker’s range not quite dialled in. Ruiz coming forward. Parker looks for his own overhand right, doesn’t land flush. Ruiz boring in looking to initiate. Parker utilising his jab well. Ruiz banking early rounds via his aggression. Parker for mine creating a deficit by not initiating, been busy enough. Needs to get into his work does Parker. Ruiz digging to the body. Parker not impressing himself on Ruiz. Parker trying to establish the jab, needs more of that to offset Ruiz. Ruiz is economical with his movement, Parker backing up. Ruiz shops with a big left hand, comes up short. Great exchange mid ring! Great exchange!! Both guys land well. Ruiz doing more. Ruiz beating Joe to pull the trigger on the inside, as a consequence stealing what is a really close round. Close round, Ruiz coming forward enough to edge, but yup! Very close and could spin either way. Ruiz round for mine but dependent on the judge could be a Parker round. Ruiz coming forward. Boxing well. Shops for a big left hand again. Joe lands his own. Parker’s speed is now being negated by Ruiz. Ruiz quick for a big man. They engage in the corner. Ruiz uses his elbows. Ruiz pressuring. Ruiz counter punching well for a heavily set man. His body type certainly doesn’t match is athleticism! Crowd gets excited as Parker finds a some r and r aka rhythm and range. Parker, lands a nice left hook. Parker going to work! And well! Parker landing the cleaner shots, got busier. Parker coming on! Ruiz coming forward. Digs a right hand to the body. Parker measuring, but not sending enough out to dissuade Ruiz. Ruiz still coming forward. Parker has the better skill set, Ruiz more aggressively minded. Ruiz seems to have slowed up a step, allowing Parker to find a groove with his jab! Ruiz digs a jab to the body. Ruiz noticeably slowing! Running out of gas? Ruiz comes up short with a left hand, Parker up on his toes, Ruiz lands a left hook on Parkers ear, Parker replies in kind. Parker fighting from the outside nicely. Parker busier, worked well on the outside. Parker on his toes. Ruiz looking a little sloppy. Ruiz digs to the body. Ruiz looks for a left hook. Parker jabbing well, needs to do more. Ruiz not as busy. Parker starting to dictate the fight? Win back ground! Parker coming on! Tide appears to be turning the way of the big New Zealand born Samoan! Ruiz still coming on but not pressing with a sustained attack. Well timed jab by Parker that dials in on Ruiz’s beak! Great exchange, both young guns loading up! And big! Good stuff! Parker touching Ruiz’s left hand with his jab, negating it. Ruiz tries to bull in. Parker not getting Ruiz to back up. Ruiz looks for a right hand, bounces off the shoulder. Ruiz aggressively minded but not enough coming down the chute and as I write that a good exchange. Ruiz looking for big shots, trying to land big, a couple do, Ruiz looked to have got the better of the exchange! Guy is willing and tough! Second wind for Ruiz? Ruiz digging left hand to the body, two late body punches by Ruiz. after the bell but no malice, they were already on their way down the barrel! Parker backing up, pawing his jab. Ruiz not allowing Parker to tie him up. Straight right from Ruiz comes up a whisker short. Ruiz looking to counter. Parker up on his toes, flicks out a couple of jabs, crowd reacts. Parker caught by a left hook, hard left hook. Parker on his toes. Ruiz hits him to the body with a right hand. Parker comes forward. Brief exchange. Parker pawing with the jab from the outside before biting down on his jab, fighting well from the outside. Great body shot by Parker. Very, very close round, both men had their moments, Parker boxing well from the outside at times. Parker round but could go either way as with a number of these rounds. Tightening up down the home stretch. Ruiz back to coming forward. Parker lands a great left hook, lands big again, Ruiz lands big. Ruiz is some type of tough and wilful, didn’t wobble, in fact gobbled up Parker’s power! Parker jabbing well, really well! Ruiz sends a 1-2 down the chute. Pro-Joe crowd getting excited. Parker carrying the left hand low, could be trying to bait the aggressive Ruiz. Parker can’t get Ruiz to back up. Ruiz digs a left hand to the body. Parker dancing, jabbing well, controlling the real estate from the outside. Ruiz coming on. Looking to land big, digs some hellacious shots to the body. Ruiz misses with an overhand right. Parker touches Ruiz with his jab, then bites down on a couple. Ruiz clips Parker with a left hook. Ruiz doesn’t look like he’s running out of petrol now! Coming forward! Parker hasn’t landed the definitive punch to back Ruiz up but boxing well! Parker busier in offsetting Ruiz’s aggression. Parker jabbing well, real well. Ruiz aggressive, misses with everything in bulling forward. Parker lands a great body shot, hurt Ruiz? Ruiz caught by a great jab, stopped him in his tracks. Ruiz lands a left hook. Ruiz aggressive and looking for a home run punch but hasn’t found it. Ruiz still coming on as he has all night. That’s it! Fights over! Ruiz raises his hands, thinks he has won! Parker looks confident! Close round, another of many, Ruiz aggressive, enough to edge the round. Parker announced as winner! Joseph Parker is the first New Zealand born heavyweight champion of the world! Andy Ruiz will be disappointed, but some of the rounds razor thin close. Joseph Parker well done! Andy Ruiz came to fight! Parker family and friends overjoyed! Kevin Barry and Parker embrace mid-ring – well done Kevin Barry! The Barry families legacy in New Zealand boxing has just given birth to another amazing chapter! 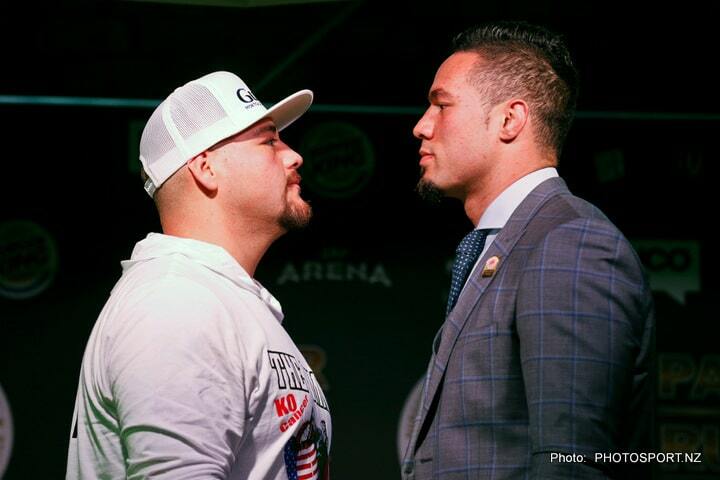 Kevin Barry talks ‘I told him to stick to the game plan…Andy Ruiz is a champion…I think they’ll fight again…Joe’s a hard worker…I’m so proud of this young man…Joseph Parker is going to have a break, he deserves some time off’. David Higgins – Parker’s promoter ‘I have to say we made it, we did it!’ not verbose in any stretch but indeed a momentous occasion for Duco, their man, their team. Last word from Parker ‘Thank you to my team, let’s celebrate New Zealand, we’ve done it!’. Succinct words from one of the nicest young men in boxing. This fight was so close it demands another. Both fighters acquitted themselves well.